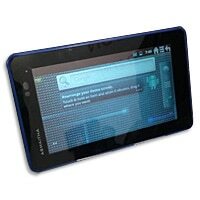 Announced in May 2012 by Indian manufacturer Asmaitha, the Sruta tablet will feature a 7-inch display, an ST Ericsson Nova 1GHz processor, and NFC. The device will run Android 2.3, with an upgrade to Android 4.0 promised by the end of the year. The tablet is expected to be released towards the end of 2012 and is could be priced at around R8,500 (US$200).